Please mail us your requirements at info@qtechcorp.com and our team will get in touch with you. 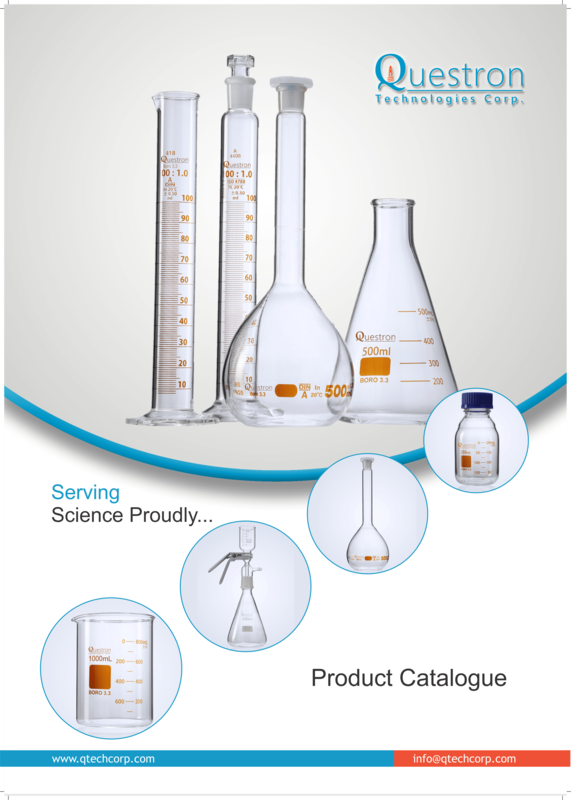 We use Borosilicate 3.3 is highly resistant to almost all Chemicals, salt solutions and other organic solvents. The labware are highly heat resistant, high resistance to thermal shock & high mechanical strength. Thermal expansion between 0-300/°C is 33 x 10-7/°C and thermal conductivity 0.0027 cal/cm³/°C/Sec. Borosilicate 3.3 can handle temperature up to 240 degree Celsius for continuous usage under general laboratory conditions , whereas it can withstanding temperature around 400-450 degree Celsius for short term usage. We are committed to produce highly accurate Labware with an in-house ISO 17025:2005 accredited laboratory, well equipped with the latest equipment for calibration under well controlled environment. Each product undergoes numerous tests right from visual inspection of newly produced material, followed by dimensional checks, calibration and marking and then re-calibration post printing and finally visual inspections before and during packaging. We are an ISO 9001:2015 and CE certified company and we conduct periodical internal audits to keep check over all the quality systems implemented and ensure our commitment to quality is well experienced by our customers. All the products are produced as per ISO/DIN/ASTM standards and requirement of the end user is kept at ultimate priority.